Guwahati, Sep 26 : A revolution is brewing in an Arunachal Pradesh district and fanning the flames of the energising change is ‘Tea Lady’ Basamlu Krisikro. A post-graduate from the Delhi University, Basamlu took to tea cultivation to give her cancer-afflicted mother her daily dose of green tea, but the venture soon mushroomed into a thriving business. Within a few years, her success story inspired several locals, who traditionally grew opium, to switch to tea crops. It is extracted from the poppy plant, which is illegally cultivated in Lohit, Anjaw, Tirap and Changlang districts in Eastern Arunachal, bordering China. Wakro alone has 12,000 to 13,000 opium cultivators. The land here was once famous for its oranges, but the yield fell drastically over the last decade, leaving the farmers high and dry. Concerned at this, Basamlu and a medical practitioner, Nayil, took it upon themselves to convince the affected ryots that tea cultivation could be an alternative source of sustainable income. They also encouraged opium farmers to replace their fields with small-scale tea plantations. And their hard work paid off. Within a year, at least a dozen of them turned into small-time tea growers. “The sudden decline in yield of oranges perplexed farmers, who consulted experts and agencies in vain. Worried about their livelihood, they began cultivating opium. As a result, the local consumption of opium increased alarmingly. Opium gave them a source of income and got them hooked on to it as well,” Basamlu told Express. “The consumption of the drug, especially among the youth, is increasing. The situation made some of us explore an alternative source of income. It was then that I got into tea cultivation. I approached some opium growers and advised them that they should opt for tea. I volunteered to provide them with technical and financial support,” Basamlu said. 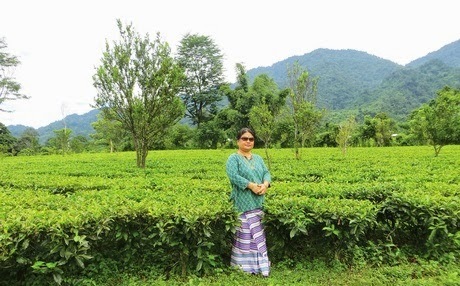 Last year, her plantation spread across five hectares of land, produced 2,000 kg of orthodox and organic green tea. Songelum, 40, is among those who gave up opium cultivation. “It is like an ATM. You will instantly get a buyer. Work hard from December to March and you will earn enough for a year. If you have a land measuring one hectare, you can get a produce of six to seven kg a year. Around `7,000 is all you will need to invest,” he said.